California is one of the best states in all of the US for kayaking and other water-based journeys and activities. Up and down the state, paddling enthusiasts can find all sorts of wonderful locations to hit the water and head out on an aquatic adventure, with Santa Cruz being an especially great spot to kayak. Far from the hustle and bustle of busier Californian cities like Los Angeles and San Francisco, Santa Cruz is a picturesque spot, nestled snugly on the edge of Monterey Bay. Well known for its beautiful boardwalk, stunning redwood forests, warm climate and gorgeous views, Santa Cruz is a wonderful spot to visit and a fantastic location to climb aboard a kayak and take in the local surroundings in a fun new way. 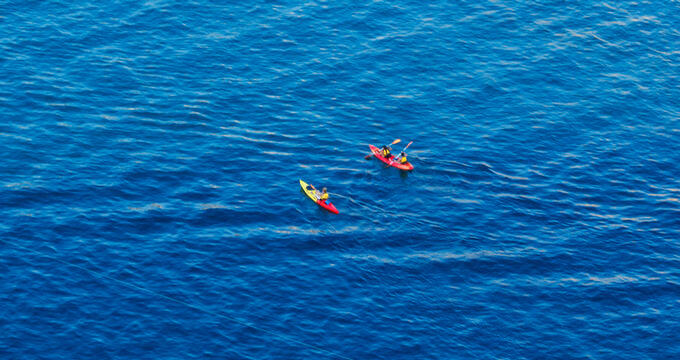 Whether you’re a seasoned kayaker with years of experience or someone just looking to give kayaking a try for the very first time, Santa Cruz’s blue waters and rich wildlife provide the perfect drop for your adventures. Wildlife enthusiasts will have a chance to get up close and personal with sea lions, otters, and pelicans, while those who really want to challenge themselves can take on some of Monterey Bay’s rougher waters. There are two key kayaking spots in Santa Cruz: Elkhorn Slough and the Santa Cruz Harbor. The former offers a kind of ‘Californian safari’ and is a big hit with animal lovers, with big chances to see the aforementioned species among others. Meanwhile, the latter lets you head out around the bay and paddle up and down the Santa Cruz coastline. With the beautiful town of Santa Cruz and surrounding forests on one side and the water on the other, this spot can provide some super views and memories to last a lifetime. Any kayaking trip to Santa Cruz simply isn’t complete without a paddle around Elkhorn Slough. Teeming with wildlife from otters and salamanders to seals and sea lions, Elkhorn Slough is one of the prettiest spots in all of Santa Cruz and a big hit with kayakers. Kayaking trips in this area almost always result in some close encounters with furry or feathered friends, making Elkhorn Slough one of the top Santa Cruz kayaking spots for families with children. The waters tend to be quite calm in this area too, so it really is a great spot for beginners or younger kayakers. Companies like Venture Quest Kayaking and Kayak Connection run various kayaking tours in the area, including the Elkhorn Slough Wildlife Tour and Family Adventure Tour. The latter is open to families with children aged as young as three and offers a relaxing, slow-paced paddle around one of Santa Cruz's real gems. The area is even a popular kayaking spot for local schools, with field trips heading out onto the waters and letting the kids get in touch with nature in a fun and fascinating way. Additional Santa Cruz kayaking tours are available for couples or more experienced kayakers looking for more intimate and relaxing trips around Elkhorn Slough. And, of course, it’s always possible to simply rent a kayak and head out on your own adventures rather than following a guide. One of Santa Cruz's loveliest landmarks is undoubtedly the harbor, and one of the best ways to take in the view is by kayak. The waters of Monterey Bay provide the perfect backdrop as you paddle along, taking in the sights and sounds of dozens and dozens of sailboats. Dolphins, California sea lions, and other marine creatures can all be spotted in the area from time to time, ensuring that every Santa Cruz kayaking trip is totally different and you never quite know what surprises might be waiting for you each time you set out. Again, various companies offer guided tours around this area, with one of the most popular options being a sunrise kayaking tour of the Santa Cruz Harbor. If you don't mind getting up early, this can be a truly once-in-a-lifetime experience, with calm waters and the early morning light offering some simply breathtaking views. A wide selection of kayaking tours is available in the Santa Cruz Harbor area, including moonlight paddles, wildlife tours, and more. Some companies also offer classes and clinics in this area, as well as kayaking clubs that meet up regularly and are always eager to welcome new members and share wisdom and new experiences. No matter what kind of kayaking experience you're looking for in the Santa Cruz area, you'll surely be able to find exactly what you need.